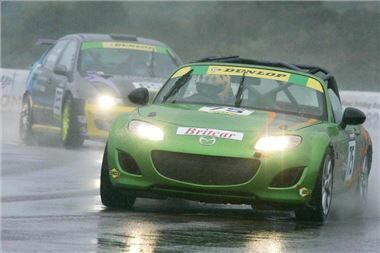 The Mazda MX-5 production race car finished third in class in round seven of the Britcar Dunlop Production GTN Championship 2011 at the Snetterton 300 Circuit in Norwich on Sunday 15 August 2011. After qualifying seventh in class on Saturday, the Mazda MX-5 production car's 50:50 weight distribution, handling and performance combined with the driving experience of legendary ex-F1 driver Mike Wilds saw the MX-5 race car fight its way to first in class in the first half of the race, further demonstrating its potential to challenge more powerful race cars in its class. During the halfway point on race day, Mike Wilds handed over to Piers Ward, Senior Road Test Editor, BBC Top Gear Magazine, to complete the final hour of the race. The Mazda MX-5 production race car continued to prove highly competitive and out handled rivals Seat Toledo, Seat Leon Cupra and the Synchro Motorsport Honda Jazz to give the production car its second podium of the season and third podium win for the team. Also competing was the MX-5 GT race car - driven by Mark Ticehurst, Mazda works driver and Owen Mildenhall, racing driver and motoring journalist - and despite a misfire during qualifying, the Jota Sport team resolved the fault and on race day the 850kg car climbed to fifth in class before a drive shaft issue saw the car recovered to the pits and unable to finish the race. "Despite the new Snetterton 300 circuit lending itself to the faster cars on track, we had a great result on Sunday, which is testament to the drivers and the handling and reliability for which the MX-5 is renowned," commented Graeme Fudge, PR Director, Mazda UK. The next race is the Britcar 24hr at Silverstone Circuit on 1-2 October 2011. For further information on the Mazda MX-5 GT race programme go to www.mazdamx5racing.co.uk or simply click here to download the free Mazda MX-5 GT motorsport iPad app from the iTunes store.